After having a number of successful exhibitions in Delhi, Pune and Parma (Italy) earlier this year, Michelle will be presenting a series of 25 new works which explore the fragility and power of nature. A series of animal portraits highlight the variance of life from the strength of the bull to the fragility and beauty of the butterfly. The works are superimposed with a mapped digital projection allowing them to run off the canvas and into the gallery and ‘our’ world. By forcing the artwork beyond the canvas and into the gallery it asks the viewer to address their own relationship with these animals. The exhibition will be followed by a collateral project at the Kochi Muziris Biennale 2018, which will further address the issue of fragility and mankind looking at conflicts and war. 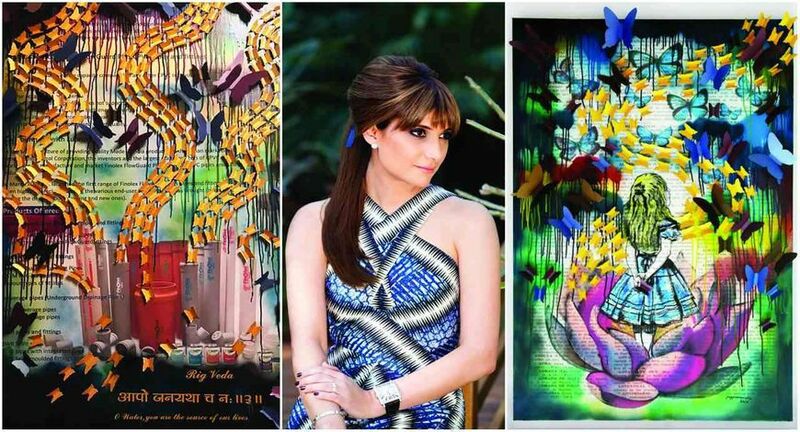 The work will continue Poonawalla’s use of digital mediums to present images of violence and suffering alongside her signature butterfly motif used to represent the souls of innocent victims of conflict.